Description: A letter-writing course for women: this workbook will make a difference in permanent ink-- not in cyberspace! Get life-changing results from your letters; learn from an expert. Structured, short topics with daily worksheets including questions and fill-in-the-blanks. Bible examples combined with down-to-earth motivation for today's Christian woman. Beautifully formatted 8 x 11 inches. 13 Chapters. Special Delivery has been a blessing to our ladies at Chapel Hill. Our first few weeks in class, especially, were incredible meetings where we shared our own special notes and letters with one another. We shed tears of joy, sorrow, love, and regret together over those wonderful words on paper that had meant so much to each of us over the years. I have seen excitement in many of the ladies as they go through the workbook. We love these daily study times and are amazed at the way Sister Jane McWhorter helps us ponder examples from the Word of God in ways that we had never considered before. I believe that our entire congregation will grow and prosper from the habits we develop through this study. One young lady in our class (whom I had not even expected to take part) came to me after the first week and excitedly announced, "I sent three notes this week!" We are grateful to be inspired to do our part to change lives through our words on paper. Jane's book arrived yesterday, and it really was a Special Delivery. I've read through the first lesson, and it is so rich--both visually and in content. I look forward to sharing it with others. I have a good friend in the congregation who is a wonderful note-writer. She sends out cards weekly, and I know she'll love it--maybe for her birthday. We exchange gifts at Christmas and on birthdays, and though her gifts are always thoughtful her notes mean even more. I do save letters--until the basket overflows. Awhile back I threw away a drawer-full of notes from children I'd taught--kinda wish I hadn't but you eventually run out of space. I got a special note last week which included a scripture that has encouraged me so much. So you were wise to see a need for writing this book, and I predict it will do well. You both should be very proud of the way it turned out. I finished a thank you letter written to Jane today. I took her book with me to class last night and talked about how it really fulfills today's needs. We passed it around and they all were impressed! I am very impressed with your block-type, note-taking page designs, divisions into sections, etc. It does have potential for great marketability. Let's face it, the physical part of the book may not be the purpose-- we realize great authors from long ago did not have it-- but nowadays with everything being so visible, we are attracted to format. You have really done a marvelous layout. You all do have class in your productions! Since I help tutor all three of the boys I note that all of their textbooks have similar formats. Ours used to be small print and 100 questions at the end of every chapter! It's here! It's here! What am I talking about? 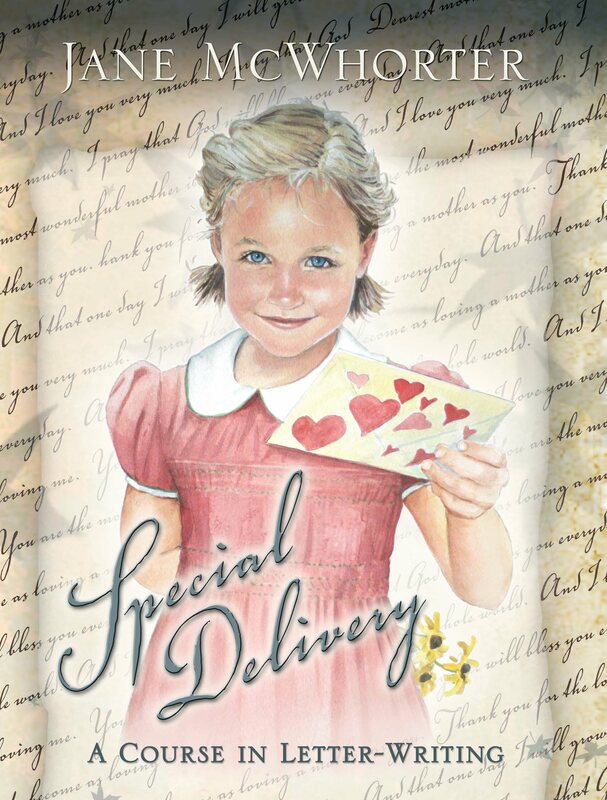 Special Delivery, by Jane McWhorter. I knew this book was in the works and have waited patiently for it's completion for some time. After spending the morning examining the book from cover to cover, I realized my wait had not been in vain, for this is truly one of the most thought- provoking books I've ever picked up. Jane takes us on a journey of letter writing that utilizes the Bible, introduces us to a whole new perspective, and gives us a glimpse of the impact of this lost art. Special Delivery, in an easy to use question and answer format, is a book that every woman needs to read and complete. It is also a book that clearly opens up writing letters as a possible ministry and one that, if you are like most women, will without a doubt change how you feel about letter writing! I just finished reading SPECIAL DELIVERY. I loved Don's letter on page 136. I liked the way Jane used scripture to help us improve our ability to communicate with others. What better resource than our own Father's words of wisdom! I've been given a new Bible for Xmas and as I read through it this year, Jane's book will be on the table with me so as phrases jump out at me, begging to be put in notes, I can write them in the "notes" section of the book to use at the appropriate time. The "For Your Notes" sections are priceless. They will be especially valuable in those situations when I know I need to send a note and can't figure out the best way to express myself. I'm grateful that Jane allows us to borrow her well crafted sentences in hopes they will encourage others. Recently I purchased the book For the Love of a Child by Wilburta Arrowood. It is an interesting story, which I really enjoyed. I'd like to see more novels like that. I'm studying Special Delivery by Jane McWhorter, which I can't praise enough. Wow! What a fantastic book for those who want to enhance their letter and note writing skills. Jane McWhorter's book Special Delivery changes lives. Our ladies' class sent 926 cards in one quarter which encouraged and uplifted many. Interwoven with many Biblical principles, it gives practical examples for serving others with pen and paper. Ordering more than 10 of Special Delivery? To order Special Delivery, click Add to Cart below. Copyright � 2002 Publishing Designs, Inc.